This is an optional specification on CURSOR declaration.The significance can be understood by considering what happens in its absence. Suppose we need to process some large table, one row at a time by means of a cursor and update a few of the as we go. It is often desirable to divide the work up into batches and to make the processing of each batch into a separate transaction (by issuing a separate commit at the end of each one); thus, e.g. a table of one million rows might be processed by a sequence of 10,000 transactions, each one dealing with just 100 rows. This way , for e.g. if it becomes necessary to roll a given transaction back, then at most 100 updates will have to be undone, instead of potentially as many as a million. The problem with this approach ,however is that every time we issue a commit, we implicitly close the cursor, thereby losing our position within the table. The first thing each transaction has to do, therefore is to execute some re-positioning code in order to get back to the row that is due to be processed next. And that re-positioning code can often be quite complex, especially if the processing sequence is determined by a combination of several columns. If the cursor declaration specifies with hold, however, commit does not close the cursor, instead, leaves it open, positioned such that the next FETCH will move it to the next row in sequence. The possibly complex code for repositioning is thus no longer required. However it is important to note that the first operation on the cursor following the commit must be fetch. Update and delete current are illegal. 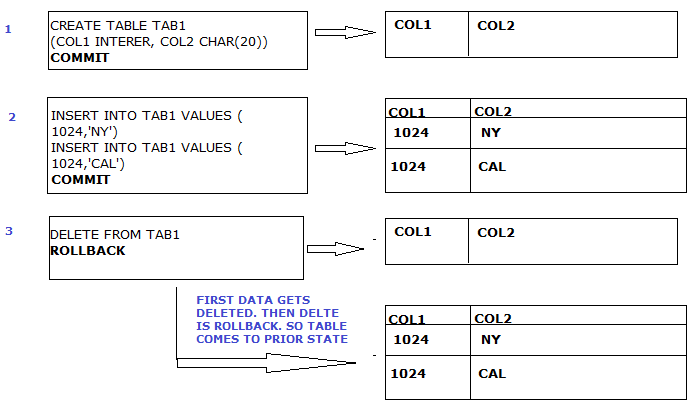 What is contoken or consistency token in DB2? We get SQL code of -818 when the Consistency Token placed by DB2 precompilation Step does not match between the DBRM and the Load Module. 80N or -805 is what we get when the DBRM or Package is not found in Plan which we used in JCL. Steps to find out the contoken and verify if both are same?? We fetch the HEX value for the contoken.Otherwise we wont be able to see the value,if fetched normally. This Fetches the program-name, its contoken, bind time and the DBRM Library order by latest bind time. we can get the same Contoken (with out using the above query also) by looking into the DBRM library for the program. Look for 25 to 32nd position in the first line. That will show the contoken. Note: F x 'search-string' . Here x implies the search string in quotes is hex value. The Basic steps involved are 1) Precompilation 2) Bind 3) Finally Execution of the COBOL DB2 program. When the cobol-DB2 complition job is submitted,the DB2 Precompilation step is first executed.Its Function is to analyse the host language source module ie, the COBOL-DB2 program and stripping out all the db2 sql statements it finds and replaces them by the host language CALL statements to the DSNHLI module. To be clear, it(the precompiler) comments out the all the DB2 SQL statement in our cobol-db2 program,and in turn calls DB2 run time interface modules. 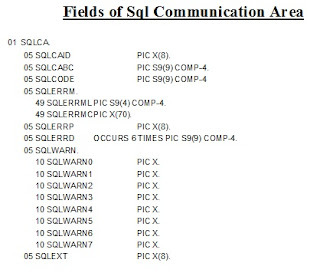 All the sql it encounters in the progrm, the precompiler puts them in a PDS know as database request module(DBRM)which becomes the input to the next step,ie the bind step. The runtime call contains necessary parameters(DBRM name,Timestamp, statement number,host variable address,SQLCA address). So here the DB2 SQL statements and Cobol code are Separated. The separated Cobol part goes to cobol compiler and stripped out SQL statements from the same program ,ie DBRM goes as input to BIND step which will create the executable code for the DB2 portion of the cobol program. The separated cobol and SQL statements must be united later in the final stage of execution.So,to help each other in finding, both the seperated parts are assigned one token,called contoken,which is basically a timestamp. a. Searches and Expands DB2 related INCLUDE members.You will see something of this sort in the program. These 'member' is nothing but DCLGEN. c. Creates the modified version of the source program where every SQL statement is commented out and call to DB2 runtime interface module replaces each original sql statement. d. All extracted SQL statements is stored in a PDS called DBRM. NOTE: DB2 catalog is not accessed during this precompilation process. or BIND the instructions into a PACKAGE. Note: Only the Plan is executable. When we say Plan is executable, it means it needs to be executed along with Cobol load module which was separated during precompilation time. At run time, the load module starts up and eventually hits a paragraph containing a call to db2. We execute the DB2 program witht the DB2 utility IKJEFT01.In the SYSIN parameter we specify the DB2 subsystem name, the plan name and the load module name. Note: The DB2 catalog only stores information about the plan. The executable form of the plan called a skeleton cursor table or SKCT is stored in DB2 directory in SYSIBM.SCT02 tabl. What is a collection in DB2 ?? ?